I was a young girl during the 1970’s a time when “enlightened” woman were fighting so I could have “equal rights”. During this time, many girls like me were being taught that we could have it all. A career, a family and all of the material trappings that would make us all so happy. Much happier than our poor mothers whom we were convinced were chained to a life of housework. As I made my way through public school, I was never taught basic things like cooking and managing a home. My mother was a excellent example of taking care of our family, in fact she considered it her career! But, I being one of the “lucky” girls of the time was more interested in pursuing a career, so learning basic skills seemed pointless to me. During college (and several major changes), I found myself studying early childhood education. I attended a school that had a lab school where we “practiced” our skills on our young students. As part of the curriculum, we had to rotate to different areas of the lab school for two week periods. The classroom, the baby and toddler room, the preschooler room and the kitchen. I was terrified! Not of working with the children, but of being in the kitchen! I was required to come up with a healthy lunch menu. It was so easy to do on paper, but to actually cook the food, I knew I was in big trouble. So I swallowed my pride and went to my teacher and confessed that the only thing I knew how to make was macaroni and cheese, frozen pizza and popcorn! She tried so hard not to laugh at me, and told me this was a great opportunity to learn. (Which was a good thing for Rob, because we were engaged to be married in a few months and at least I would know how to cook something!) So my crash course in cooking began. The aged women likewise, that they be in behavior as become holiness, not false accusers, not given to much wine, teachers of good things; That they may teach the young women to be sober, to love their husbands, to love their children,5 To be discreet, chaste, keepers at home, good, obedient to their own husbands, that the word of God be not blasphemed. Wow! We are to do this so that the “word of God may not be blasphemed”! 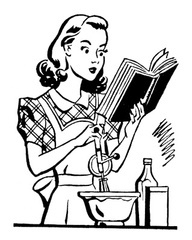 I had never considered that being a homemaker was what God had designed women to do, (as well to be sober, loving my husband and children discrete, chaste, good and being obedient to our husbands!) and by not doing what God has designed us to do we are being reproachful, contemptuous and irreverent and the Word of God is being blasphemed! I, as an older woman, am now to teach the young woman to do these things! What an amazing privilege and responsibility! The world will continue to tell us that we are wasting our time and talent, but what could be more important than this! Love this. I have always just wanted to stay home with my kids and be a mama. Not many at all understand, even in the church.